Arunachal Pradesh Chief Minister Pema Khandu joined the rest of the country in mourning the sad demise of veteran actor and sitting BJP MP Vinod Khanna who passed away at the age of 70 on Thursday. In his condolence message to the eldest son of the legendary actor Rahul Khanna, Khandu wrote “with profound grief I write to share the grief of losing one of the finest actors ever produced by India and a charismatic, influential and dedicated leader of our great nation. The news of his demise came as a shocker to the people of the entire country. Late Vinod Khanna will rule the hearts of millions for being one of the most stylish, handsome and an awesome actor of all time. 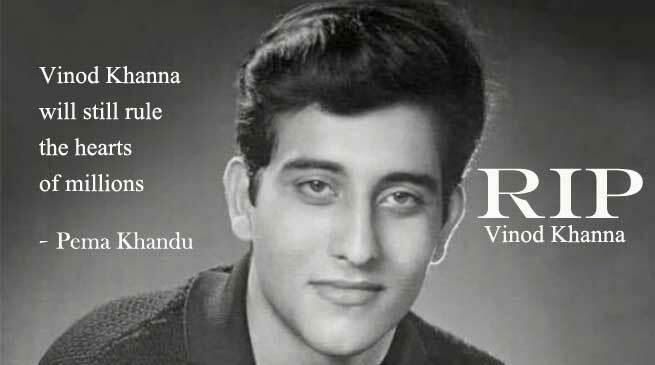 A sitting Bharatiya Janata Party MP from Gurdaspur district of Punjab, Late Vinod Khanna proved the country that he is versatile in every sphere. Apart from being a legend in Indian Cinema, he proved his mettle as a seasoned politician who undertook many welfare initiatives. I believe, leaving this mortal world will not diminish the love and affection showered on him by the people and his soul will remain immortal. So would his footsteps and the contributions made to the country during his long and memorable decades of Film World and political career. I know this would be the most trying times for the people of the country and family members to cope with the irreparable loss, I hope my humble words of consolation would ease the grief even if a little. In this moment of grief, me, my family, colleagues in the Government and people of Arunachal Pradesh extend our solidarity with you and share the pain inflicted on you and the family members by one of the greatest truths of life” the message added. He prayed almighty God to give strength to the bereaved family members to bear the irreparable loss.